Following the footsteps of Airtel Digital TV, Tata Sky revealed various regional packs at a starting price of Rs 7. The 14 new regional packs from Tata Sky can be activated by any Tata Sky customer located in India. Same as the case with Airtel Digital TV, additional NCF charges of Rs 153 will be applicable on top of the regional pack you choose. Basically, Tata Sky is removing the hassle of choosing the Ala-Carte channels individually for the users. As noted, the Regional Packs from Tata Sky start at Rs 7 and the pricier one on the list is Telugu Regional pack which is priced at Rs 136. Tata Sky already unveiled individual channel prices two weeks ago and is currently taking options from users. Tata Sky subscribers who exercised their options under the new Trai regime already noticing activation on their STBs. 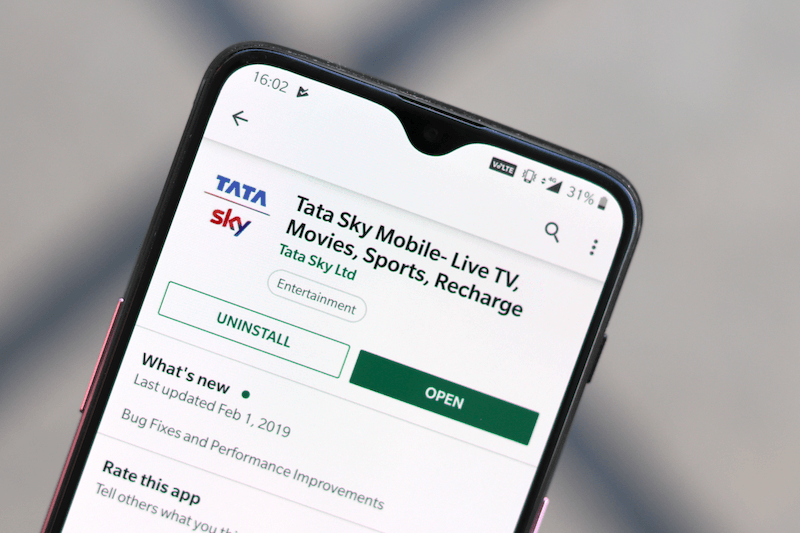 Tata Sky Regional Packs Start at Rs 7: What Do They Offer? Notably, these regional packs from Tata Sky are pretty much identical to those of Airtel Digital TV. Maybe, all the service providers will come with similar packs going forward. 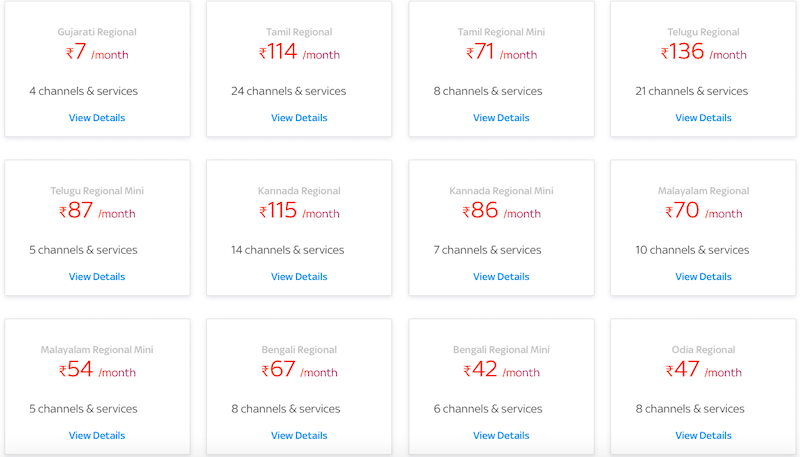 As mentioned above, Tata Sky has launched 14 regional packs- Gujarati Regional (Rs 7), Tamil Regional (Rs 114), Tamil Regional Mini (Rs 71), Telugu Regional (Rs 136), Telugu Regional Mini (Rs 87), Kannada Regional (Rs 115), Kannada Regional Mini (Rs 86), Malayalam Regional (Rs 70), Malayalam Regional Mini (Rs 56), Bengali Regional (Rs 67), Bengali Regional Mini (Rs 42), Odia Regional (Rs 47), Marathi Regional (Rs 53) and Marathi Regional Mini (Rs 45). Unlike Airtel Digital TV which did not reveal the individual channels inside the regional pack, Tata Sky has revealed them. The Gujarati Regional pack comes with four channels & services which is least amongst all, while the Tamil Regional pack priced at Rs 114 offers 24 channels & services. Tata Sky users interested in these regional packs can log into their account via the website or mobile app to activate them. These packs are more than enough for basic users. For example, if a subscriber looking for just Telugu channels can choose the Tata Sky Telugu Regional pack priced at Rs 136. On top of the regional pack price, additional Network Fee charges of Rs 153 will be applicable and the final price per month becomes Rs 289. Tata Sky is also providing DD and Complimentary packs as part of FTA Promo offer. Users can select the regional packs as their wish, but the Network Fee charges of Rs 153 is fixed. The Telecom Regulatory Authority of India (Trai) has directed all the service providers to migrate the consumers from February 1. To recall, Tata Sky was the last service provider to reveal the new channel packs based on Trai’s pricing. However, it’s not falling short in other regions. Tata Sky already shifted customers who exercised their options. Some users are complaining that they’re just able to view the Ala-Carte channels and not the FTA channels, but the issue will be fixed very soon. If you have already exercised the options and Tata Sky did not activate the same, then try resubmitting your options again. The DTH service provider is allowing users to exercise options via the website and its mobile app.